Disclaimer: Beyond the BandaideTM is not a medical organization nor a professional counseling service. We offer peer support only. Any advice, links, ideas, or suggestions presented on our pages should not be used in place of the advice of a qualified professional. or organization isn't right for you, another one will be." offers victims of sexual abuse and post-abortion trauma hope for their own healing. step process of overcoming the persuasive destruction of sexual abusive. sexual sin has infiltrated the Christian community, leaving suffering and scarred lives in its wake. and specialized training. An outreach of Abortion Recovery InterNational (ARIN). articles, and resources. The home of the "unchoice" campaign. through training programs, resources, research and promoting awareness of post-abortion. goals to achieve productive lives. This study helps men who are tired of fighting alone to acknowledge and face their inner turmoil head-on. God's unchanging, loving character, and His desire to forgive them and heal their father-hearts. Bible study for healing after abortion. This page includes streaming audio presentations. men and women discover freedom from their past hurts! Click here to read an interview with Carol. This is a compilation of stories by women who have experienced an abortion and it's painful after effects. The book chronicles their journeys toward healing through acceptance, mercy and forgiveness. This book of fifteen short, riveting stories, told without editorial comment, offers hope and healing. place where over 35,000 deaths occurred during the years an abortion clinic was located on this site. But what was once a place of death is now a place of life and hope. honors and memorializes our nameless sons and daughters lost through abortion in Waco, TX. the gardens of hope worldwide. history and many other resources including who is Jesus, pod casts, audio, chat rooms & prayer. protection of the rights of pregnant mothers. raises a woman's breast cancer risk. promotes Biblical values and family traditions; US coalition of conservative women. promotes the traditional family unit and the Judeo-Christian value system upon which it is built on. euthanasia and stem cell research. receive the latest headlines "NewsBrief" summary in your inbox each weekday afternoon. provides faith-based media content for broadcasting all over the world. talk radio from a Christian worldview. from across the country and around the world with our host Jim Anderson. listen to archived radio stories about hope after abortion. influencing entertainment industry executives and helping families make wise media choices. Willis, Lindsay Lohan, and Steven Spielberg. Check to see how your favorite movie or video has been reviewed. one-minute commentaries PSA heard on 1000 radio stations. voice over talent for media projects. Click here to watch this 30-second TV ad. Click here to watch this 30-second ad. For additional 'unchoice campaign' radio spots, click here. The 'Unchoice Campaign' is a project of the Elliot Institute. They advise since this is a sensitive and complex issue, and since the typical consumer must see an ad up to 6 times before it "sticks" ... a multimedia campaign - consistent in colors, image, graphics, message, audience and purpose - is important. your source for Christian and family videos and DVDs. Wholesome movies children, teens, and adults. Clearance videos on DVD and VHS. appreciate the things that truly matter in director Alejandro Monteverde's emotional tale of self discovery. are exposed, and you'll discover the shocking twist which reveals the chilling and unforeseeable truth. * Special pricing when purchased as a set with "I was wrong." It is difficult for most of us to admit that we are wrong in the minute day-to-day failings in our lives. 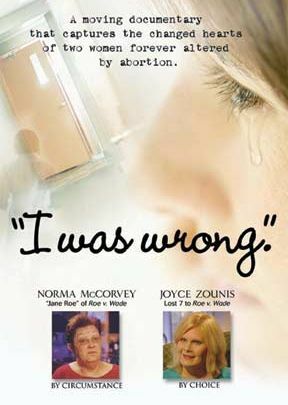 of Roe v. Wade, icon of choice and Joyce Zounis, seven-time consumer of choice. up shaping the future of America.